Does Your Compactor Tell You When something is Wrong and How to Fix it? iSMART COMPACTOR is connected to the IoT, (Internet of Things) allowing our team to monitor and run wireless diagnostics. Save time and money by being proactive with your yearly preventative maintenance, and keeping your compactor at maximum efficiency with our wireless service disruption notifications. Optimize your waste disposal operations and lower costs across the board. We will advise you of any issue that can be resolved without a service visit. Our technicians are ready 24/7 in case of a more complex issue. The iSMART Compactor can detect issues and then alert our staff. All alerts are saved in the database and our staff is on hand to analyze the issue and contact you right away. Simple issues can usually be resolved over the phone with the guidance of our technicians. If we identify something more complex, we will dispatch a technician to your location. This helps keep your equipment in top shape and eliminate unnecessary service calls. 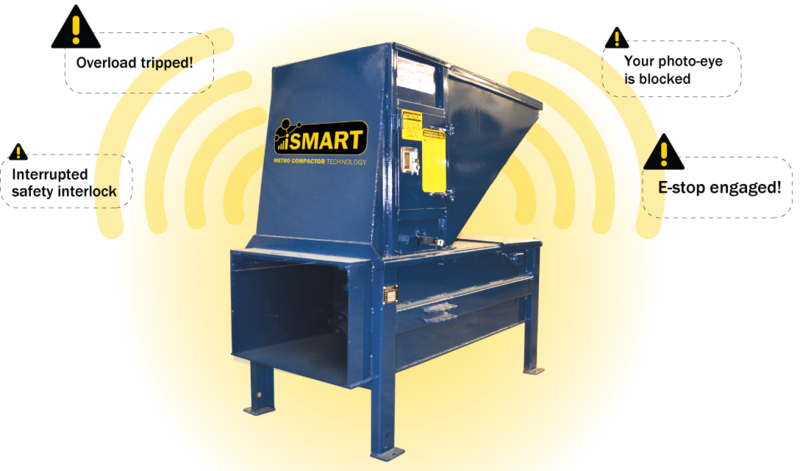 Let us show you how an iSMART Compactor can help you save on your waste management costs!